On Sunday I was pleased to be able to join 46 other folks on an tour of the Boeing factory in Mukilteo, Washington as part of Aviation Geekfest hosted by Alaska Airlines, Horizon Air and the Future of Flight Aviation Center. In a testament to the power of social media – or the fact that aviation geeks are quick on the trigger – the free tickets for the event “sold out” in less than a minute. Part of the attraction: attendees were promised a chance at winning gift cards from Alaska Airlines, a spiffy model of an Alaska Airlines 737-900, and – get this – two tickets on the 1st 787 flight. No one was allowed to bring cameras or telephones with cameras on the tour. So I can’t show you photos of new 787 Dreamliner airplanes in production. I did take a notepad along. But sadly, I can’t draw. Next time, I’m taking a sketch artist along, but in the meantime, here’s a better drawing of the airplane, courtesy of the CD that tour guide Mike (friendly, smart, informative and no where near as corny as he could have been given his audience) handed each of us at the end of the tour. 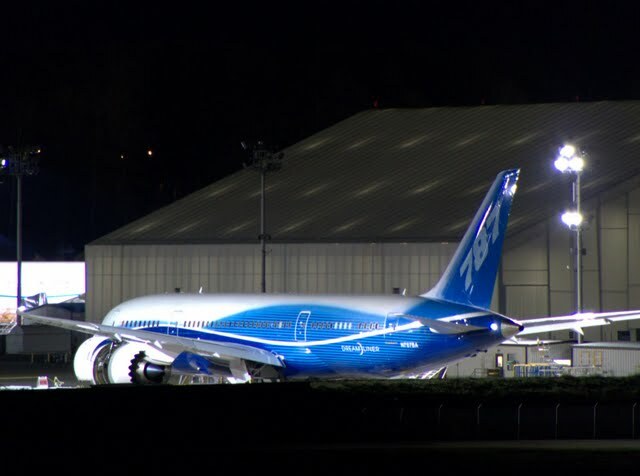 And here’s a photo of the 787 Dreamliner plane that should be taking off any moment now. Photo courtesy Aviation Geekfest attendee and Twitter user @imperfectsense.